The market for soybean has been steadily rising and this has led to companies expending money into research and development of new and better products to satisfy the customer demand for different food products. A report by Transparency Market Research forecasts the global soybean market to rise at a CAGR of 5.0% during the period between 2017 and 2025 to become worth US$215.746 bn by 2025 from US$146.23 bn in 2017. The two main sources of soybean can be classified into conventional and organic. Of the two, the organic segment is more popular because of the increasing preference of consumers for organic stuff sans chemicals and artificial additives that are usually bad for health. In the years ahead, the segment will likely expand at a greater CAGR of 8.1% to become worth US$1.38 bn. The conventional segment is expected to rise at a CAGR of 5.0% to attain a value of US$214.366 bn. Depending upon end use again, the soybean market can be segmented into food and beverages, personal care, dietary supplements, pharmaceuticals, animal feed, etc. Among them, the segment of animal feed accounts for maximum share in revenue at present. The report by TMR estimates the share to be around 75.1% currently. In the years ahead too, the animal feed sector is predicted expand at a healthy clip. The soy meal segment accounts for the largest share and is followed by the soy oil segment. Some of the main end products in the global soybean market are whole, protein, oil, meal, and others namely tofu, soybean milk, fiber. The protein segment of the soybean market can be further sub-segmented into soy protein concentrates, isolates, and hydrolysates. Amongt these segments, the soybean meal segment occupies leading share in the market – about 72.9%. Geographically, some of the key segments in the global soybean market are North America, Latin America, Europe, Asia Pacific, and the Middle East and Africa. Of them, Asia Pacific is expected to account for the leading share vis-à-vis demand in the years to come due to its massive population, developing economies wherein more and more people are opting for healthy food, and rising awareness about the high protein content of soybean. The animal feed industry and nutraceuticals are also stoking growth in the market in the region. Asia Pacific will most likely be trailed by Latin America and North America. Together, Asia Pacific and Latin-America are likely to account for approximately 78.1% share by the end of 2025. The demand for soybeans in the three key markets is being primarily driven by the increasing consumption of soybean as a natural alternative to meat and dairy proteins and utilization as an ingredient in sports nutrition and in clean-labelled products. Some of the prominent companies operating in the global soybean market are Kerry Inc., Fuji Oil Group, House Foods Group Inc, The WhiteWave Foods Company, E.I. du Pont de Nemours & Co., CHS Inc., Cargill Inc, The Scoular Company, Archer-Daniels Midland Co. The global soybean market is driven by the increasing awareness among consumers regarding the health benefits of soybean and therefore it's increased number of applications. Today soybean is also used in animal feed. Since soybean helps in improving the metabolism, people can gain weight in a healthy manner and also have better digestive health, thus driving its demand. Soybean can help defend against cancer, reduce the impact of menopause, enhance the health of bones, protect the heart, and protect against birth defects. It also decreases the risk of diabetes and increases circulation. All these factors are anticipated to fuel the demand for soybeans in the next few years. On the other hand, daily protein ingredients are increasingly gaining consumer acceptance which will threaten the demand for soya bean. Manufacturers are increasingly finding it difficult to maintain the final price of the product on account of the volatility in terms of raw material supply and demand. As per Transparency Market Research (TMR), the global soybean Market is anticipated to rise from US$146.23 bn in 2017 to US$215.746 bn by 2025, expanding at a 5% CAGR between 2017 and 2025. There are two types of soybean sources, organic and conventional. Of these, it is expected that the organic segment will expand at a faster pace as consumers are now preferring products which are natural and devoid of any additives. It is most likely that the organic segment will expand at an 8.1% CAGR between 2017 and 2025. 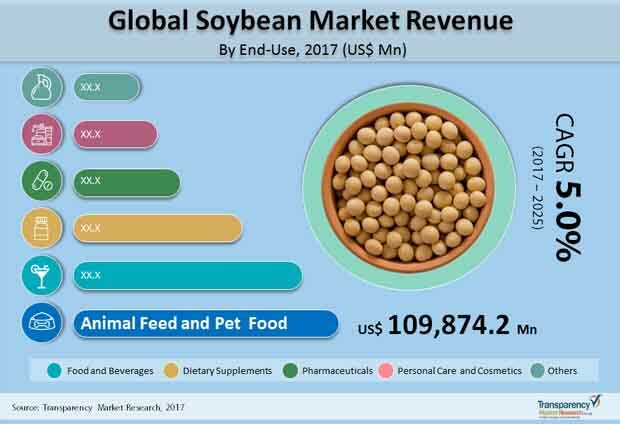 By end use, the global soybean market is segmented into dietary supplements, food and beverages, pharmaceuticals, personal care, and animal feed. Of these, the highest revenue was generated from the animal feed segment. The animal feed segment accounted for 75.1% of the total market and is expected to continue to expand at a healthy pace in the years to come. Oil, protein, milk, tofu, fiber, soy milk are key products of soya bean. Of these it is anticipated that the soybean meal segment will dominate in the market, accounting for 72.9% of the total market. On the basis of geography the global soybean market is segmented into Asia Pacific, Europe, North America, and the Rest of the World. Among these, Asia Pacific is leading in terms of highest demand. The high population, increasing number of people in emerging nations who have developed a strong inclination for healthy food, and rising awareness about the protein content of soybean among consumers will drive the Asia Pacific soybean market. The demand for soybean from nutraceuticals sector will also help the market to grow in this region. In addition to this, the animal feed industry is also stoking the growth of this market. Latin America is expected to be the second leading segment, region wise for the soybean market followed by North America. Latin American and Asia Pacific are expected to collectively account for a whopping 78.1% of the total market by 2025. Increasing consumption of soybean in place of dairy proteins and as a alternative to meat will fuel the growth of this market in these two regions. Soybean is also used as an active ingredient in clean label products and sports nutrition products. Players within the soybean market are attempting to develop innovative soybean based foods which have improved functionality. Players are also experimenting with newer blends in order to enhance the application areas of soybean. Some of the prominent players within the market include: Fuji Oil Group, Kerry Inc., House Foods Group Inc, E.I. du Pont de Nemours & Co., The WhiteWave Foods Company, CHS Inc., The Scoular Company, Cargill Inc, and Archer-Daniels Midland Co.